Calling "Shotgun" might be the wrong word, since the driver's cab would be on top of the train, or absent altogether. 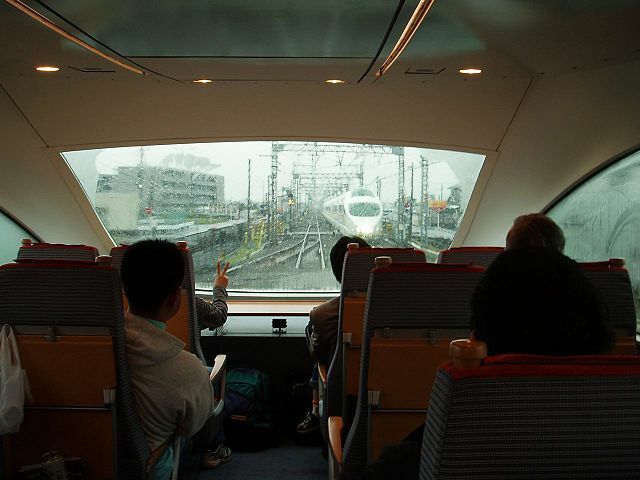 What are some examples of high-speed long-distance intercity trains that have passenger seats in the front of the train? If available, the following information would also be useful. Is the driver cab sitting on top of the first carriage, or fully automated? Can the ticket be purchased only if the front passenger seat is available, and then subsequently blocked in the ticket holder's name? Does the train go above 100 mph? Is the scenery beautiful, or does the train go mostly in tunnels? Can we paste a photo from the front passenger seat in the answer? 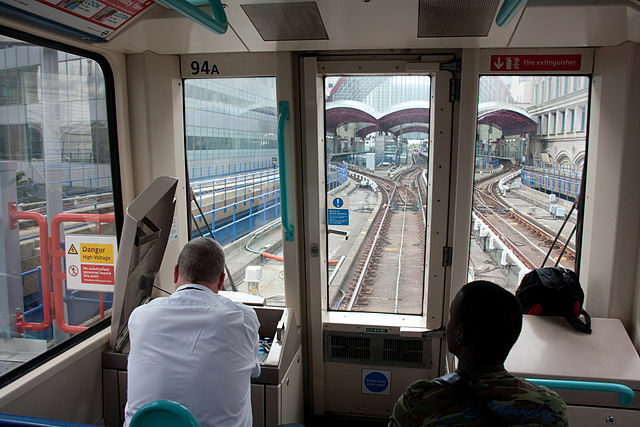 The DLR is fully automated. Although a driver's console is concealed inside a locked panel just in case, as shown in the photo, all four front seats are almost always used by passengers. No, but you can easily get the front seat from a terminal station on weekends. The view isn't great (see photo), and there is a fair amount of tunnel. Photo from the front passenger seat, courtesy Wikimedia. There are several cities with automated metro trains like the DLR - But this question would only be for the truly high-speed long-distance intercity trains. The line connects Shinjuku in Tokyo with various tourist areas towards Mt. Fuji to the southwest. The trains with passengers seats at the front of the train (only the type 7000 and 50000 trains are currently in operation) are primary used on train services to Hakone. The schedule identifies which type of train will be used. The trips take about 1h10m to 1h30m. 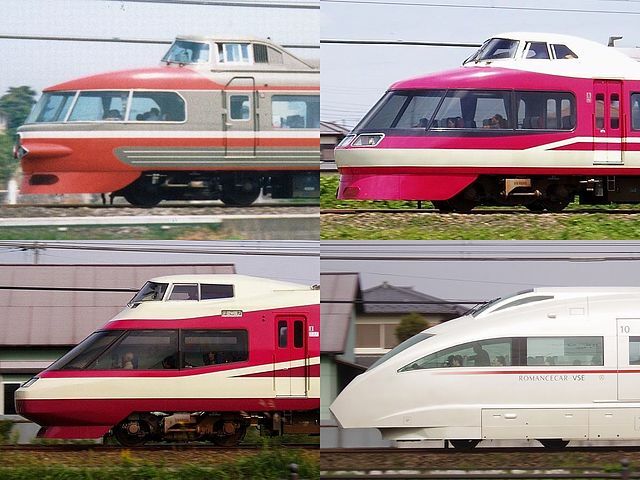 Over time, there have been several incarnations of this kind of train over time. Types 7000 and 50000 are the two on the right. Seats can be reserved online here. I'm sure they can also be reserved locally at the ticket office, but you'd probably want to reserve in advance. The train does not exceed 100 mph. It looks like the maximum operating speed is around 70 mph. The line isn't full of tunnels, but it is also traveling through the suburbs of Tokyo... so not the most scenic. However, as you approach Hakone you do get into the foothills so there it's not entirely devoid of beautiful scenery. The SNCF X3800 "Picasso" (more details in french) was used from 1950 to 1988 in France. 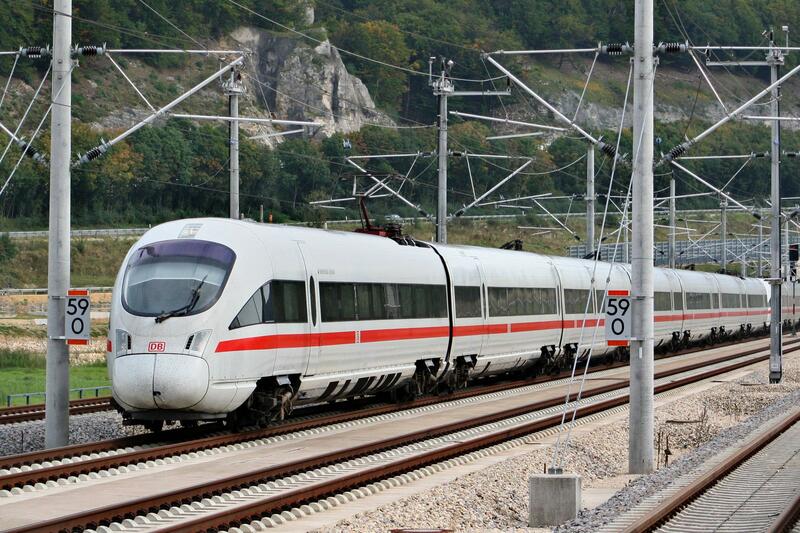 However, it definitely does not qualify for "high-speed" (top speed 120 km/h). It is still in use on a few heritage railway lines (see french Wikipedia page linked above for details), some of which probably have quite picturesque views. Is the driver cab sitting on top of the first carriage, or fully automated? Neither. 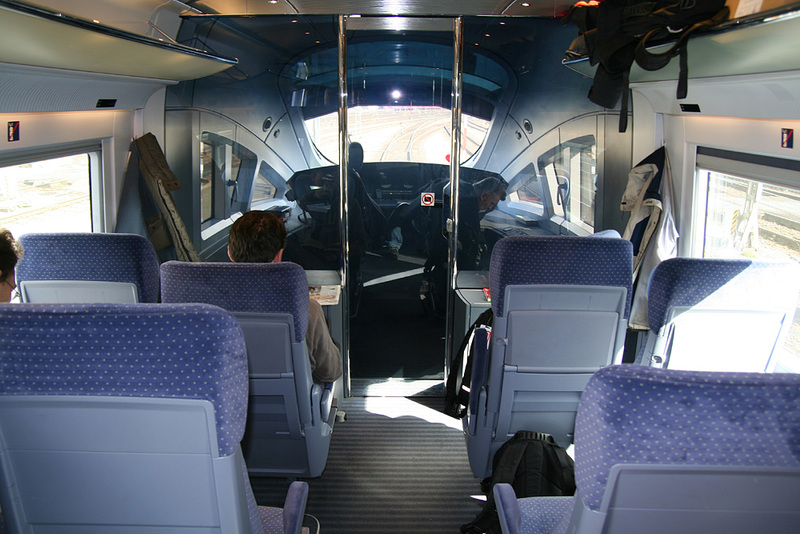 The driver sits in front, with a transparent partition. The driver has a switch to make the glass panel opaque. Can the ticket be purchased only if the front passenger seat is available, and then subsequently blocked in the ticket holder's name? Tickets can always be purchased and do not come with an automatic seat reservation. Any ticket valid for the train entitles you to check if the seats are free. As per 2015, DB lets you choose your desired seat from a seat map of the cars by mouse click (provided the seat is free). Reservation costs an additional €4.50 (for the 2015/2016 timetable year). Note that each EMU/DMU comes with two such compartments: One is always first class, the other always second class. Does the train go above 100 mph? Yes. Is the scenery beautiful, or does the train go mostly in tunnels? European pastures - beautiful. Can we paste a photo from the front passenger seat in the answer? Done. Not the answer you're looking for? Browse other questions tagged trains factoids seating high-speed-rail scenic-routes or ask your own question.